We've all heard of the big name contour kits on the market; Anastasia Beverly Hills', Smashbox's, Kat Von D's, just to name a few. But when it comes to creating a killer contour is it necessary to spend so much on an expensive kit like that? Since purchasing the Barry M Chisel Cheeks Contour Kit, I'm positive the answer is no. I find myself reaching for this kit day in, day out to create my perfect contour and not only can I rely on it to help me create a flawless, chiseled face, I can also rely on it not to break the bank. 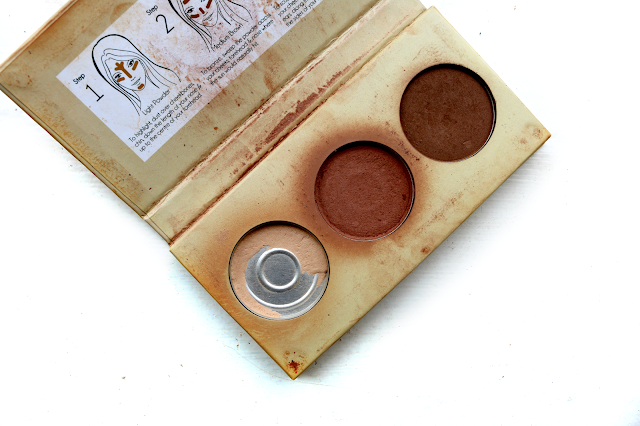 I've mentioned this product a few times here and there on this blog, but I wanted to talk in detail about it and give it the time in the limelight that it deserves because for me, it is the best budget contour kit out there. Upon opening this kit you will find three shades. Yes, only three. Seems small in comparison to the six shades you get in the Anastasia Beverly Hills kit, I know, but in reality I don't think you need all six of those shades to get a decent job done. I hear you asking me, "But how can it be versatile for all skin tones if there are only three shades?" and the answer is, because all the colours are very buildable. With each shade I can either create an intense look or very natural one by building the shades and this is what makes it good for all skin tones as you can apply the darkest shade super lightly if you're very fair, or if you're darker toned you can layer it to deepen and intensify the colour. The three matte shades in the kit are a light shade, medium brown shade and deep brown shade. The light shade is an almost bone shade which I find absolutely perfect for setting my under eye concealer and also foundation in the places I get oily such as my nose, forehead and chin. After applying it under my eyes I find that my concealer does not crease and it also brightens that area up considerably which is great for bringing it forward; it's a start to the chiseled, defined look that contouring creates. As you can see from the pictures I've used this shade so much, almost every day, because honestly it just works so well and instantly makes me look more awake and radiant. The two brown shades in the contour kit, for me, are the exact perfect shades for my skin tone. I find the medium brown shade warm enough to bronze up my skin well, but not too warm that it makes me appear orange. It can be quite hard to find bronzers with that balance (many a times I've bought a bronzer only to find it makes me orange), so I'm in love with the look this creates. It makes me look effortlessly sun kissed and more defined and if I was in a rush I could even build on this shade and use it as a contour if necessary. The darker brown shade which is meant for your contour is perfection for me. Although I'm slightly darker skinned I am cool toned rather than warm and the darker contour shade is just that tiny bit on the cool side which I'm absolutely obsessed with. It works so well to create a natural (or not so natural if desired) contour and I truly think it would suit any skin tone. One of my biggest gripes about some inexpensive powder products is that they can be somewhat chalky, which makes them appear muddy and difficult to blend. I've found with this contour kit, even though it is super affordable, the textures of all of the powders are gorgeous, and even though they are matte they are effortless to blend and I'd even go as far to say they have a somewhat satin feel to them. For me, this is the quality that makes this product stand out as being the best budget contour kit as even if a colour is perfect a product is ruined for me if the textures are difficult or it sits on the skin badly. Ps. So sorry about my totally grubby product! It's used so often the powders just go everywhere and settle where they want- they do their own thing. I'm not gross I promise. Really great review, looks to bronzey for my pale skin, I prefer to contour with grey/ashier tones for my shadows but great kit for the price! Wow, it really does look like you love this palette. It's such a bargain. I need to pick it up! You totally sold me this to me. I really need to get my hands on this. Heard so many good things about this product, the colours are too pale for my skin though. Hopin#g they'll come out with a darker palette! Great review!